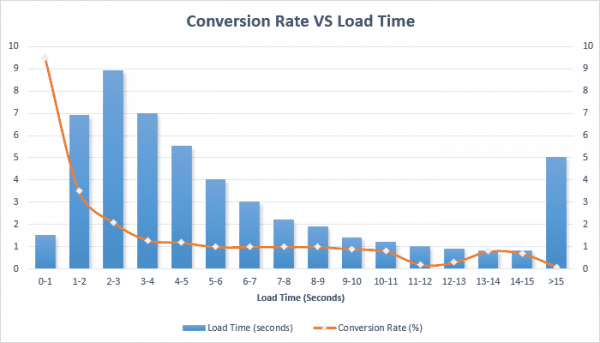 Why is page load time so important for your website? In the industry of boats and especially when we are looking at the leisure boating industry pictures/images play an incredibly important role in making a website successful. Getting a prospective client to fill in a form and enquire for more info is the name of the game. Ultimately, it is about motivating people enough to make that first move on your websites. Have you ever heard the sentence ‘an image speaks more than 1000 words’ well that is very much the case with all sorts of communication but when it comes to luxury items it’s exponentially true. Not to mention that in these times we live in a lot of the content (images, text, videos) are consumed on-the-go on mobile devices. Some of you may think we are stating the obvious; good images = better communication however, on the web ‘good’ images can come at a ‘high price’ which means a lot of KB or even MB (kilobytes or Megabytes of data) to load on each page when a web visitor is browsing your website. The key phrase here is PAGE LOAD SPEED. Among these 4 points the only one that isn’t not self explanatory is number 3: The number of requests. The number of requests (a.k.a. : number of Calls ) is the total number of request that a browser used by your website visitor ‘asks’ your server to load in order to put together the full page and display it. Think of it (metaphorically) as the number of pieces of a puzzle that you need to display the whole home page for your web visitors. In the image below you can see the number of calls sorted by load time. We can guarantee that you traffic will increase and your leads will increase as a consequence as soon as you website is speed-optimised. 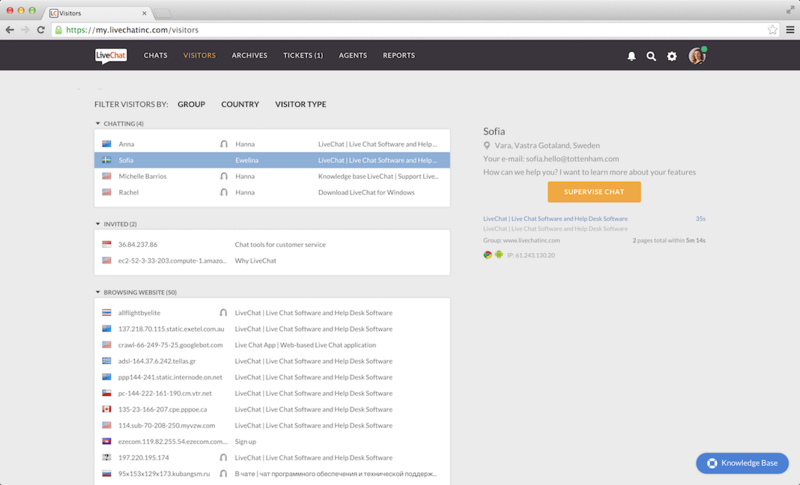 HOSTING: We highly recommend SiteGround but you can try many other services and see which fits you best. The reasons why we love SiteGround are numerous and quite technical so we won’t go into too much details, however, it is incredibly simple to migrate a website to them because the will assist you step-by-step and their customer support and speed is second to none especially if you are using wordpress. 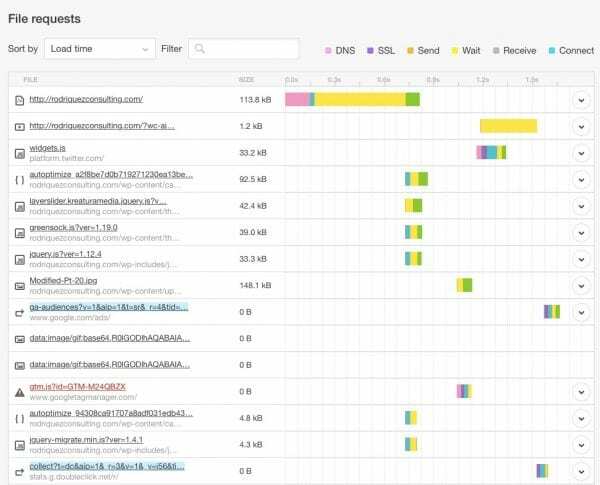 If your website is of the size of Netflix or YachtWorld.com you will probably need AWS (Amazon Web Server) but chances are you will be already on AWS paying 20-30 times what Siteground would charge you. https://rodriquezconsulting.com/wp-content/uploads/2017/07/Load-Time-e1501057703904.jpg 258 577 Rodriquez Consulting http://rodriquezconsulting.com/wp-content/uploads/2014/09/Rodriquez-Consulting-logo11-300x94.gif Rodriquez Consulting2017-07-26 08:30:302017-08-03 08:27:46Why is page load time so important for your website? What price should I pay for the boat I want? A yacht or a boat valuation is no ordinary process and it can hardly be compared to other vehicles like cars or even planes simply because most boats are built in very small series or one-off and even those that do have a production line are hardly identical to one another and without a doubt the way that have been maintained can make two identical models can be seen with prices that are different by 2x or more. (exceptions can be made for some personal watercraft and a very few more modern brands). A lot of vessels, often some of the most beautiful you will ever see, have only been built once and never replicated therefore it is hard to compare them to another similar vessel. The way we approach valuations is essentially a combination of a technical valuation of the vessel and its status together with a market valuation based on some comparable boats from comparable [or the same] designer/shipayard. However, in this [apparently] simple equation there is one element we take into account very seriously and that is that the yacht market is relatively illiquid [not easily convertible into cash] at least in several size segments, therefore, the rarity of buyers gives them the opportunity to have an advantage on the price. On the other hand, it can be counter argued that those who buy boats, especially above the 50 feet segment, are generally not desperate for cash, and therefore can afford to play hardball on their sale price. One more element that is to consider in terms of liquidity of the market is the very geographical area the vessel is located. For example areas such as the South of Florida in the U.S. are far more liquid markets than the UK, therefore you will often see faster transaction and less tiring negotiations than in other parts of the world. This is not to say that you can’t get lucky and acquire a vessel for a significantly lower price that what a technical valuation would suggest. however, these are often complex situations such as bankruptcies or even divorces at times and need to be handled with care. Indeed, it is not uncommon to find an owner who might not even know [maybe because he/she inherited the vessel] that the vessel actually comes with a £40,000 unpaid bill from the marina where the vessel was moored in the last 2 years. 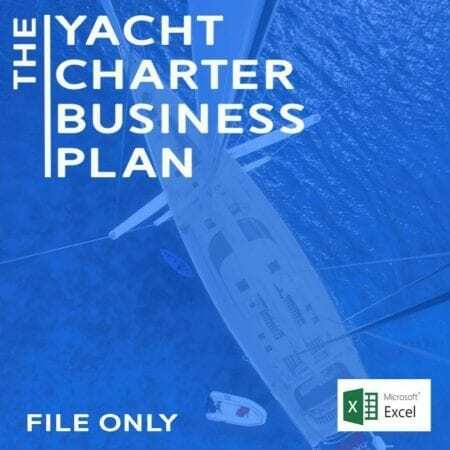 Helping people acquire their favourite boat or their ideal charter vessel is something we have always been passionate about, therefore, we are in the process of building a free Yacht Valuation Form to help you acquire your next boat at the right price. 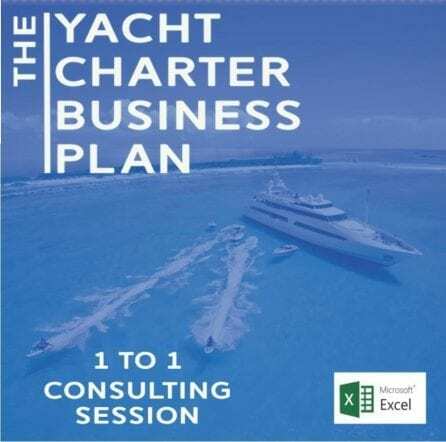 https://rodriquezconsulting.com/wp-content/uploads/2017/07/Yacht-Valuation.jpg 598 900 Rodriquez Consulting http://rodriquezconsulting.com/wp-content/uploads/2014/09/Rodriquez-Consulting-logo11-300x94.gif Rodriquez Consulting2017-07-13 20:11:072018-05-17 12:12:33What price should I pay for the boat I want? 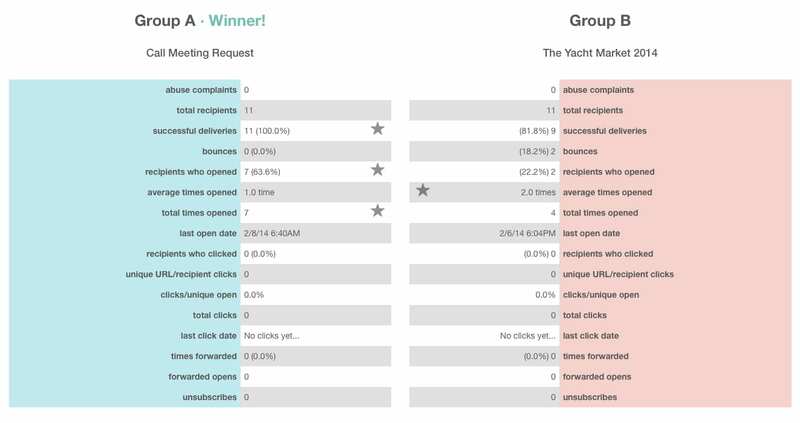 Increasing the conversion rate on a yacht related website is not a one size-fits-all job. The truth to be told is that the yachting industry is still strongly based on relationship building. Not many people really buy a boat online (over 20 feet) and even those companies who are very experienced in selling yacht charters like BoatBooking.com don’t believe that yacht charter holidays can be sold online with no human-to-human interaction on a 1-1 basis just yet. Therefore, it is crucial to increase and optimise conversion rate. Conversion rate is the measure of how many website visitors become leads and then again how many leads become customers. It is a numbers game but also a game based on relationship building. Fortunately, technology is much better and more affordable than it was even only 10 years ago. 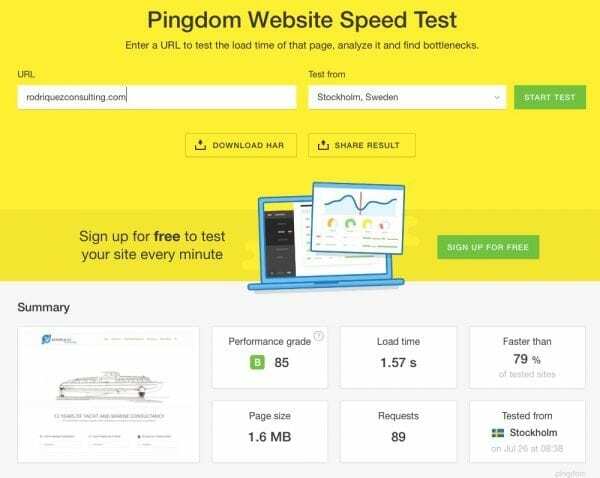 There are plenty of tools that are aimed at improving and increasing the interaction between website visitors and the business behind the website. One tool which has given us a lot of satisfaction with a number of clients including the one mentioned previously is the live chat tool . The reason is fairly simple. It allows people to talk to the business behind the website they are visiting and ask them all sorts of questions. While it sometimes can be a huge waste of time on high traffic websites it is incredibly useful for websites who do not have traffic numbers in the tens of thousand every day. Furthermore, every conversation (chat) can be useful to understand how the business can improve its website and provide information (maybe as FAQs) that are get repeatedly asked in a number of chats. On the other hand if you are an experienced yacht broker for example you will have immediately a sense for who you are speaking to (chatting) by the question one asks. In one case of one clients the mere customisation of the live chat we did for them brought their conversion rate up by 4% in less than 30 days. The reason behind it was that real prospective customers who wanted to charter yachts could immediately understand from the chats that they were talking to real experienced brokers instead of a contact center in a developing country, that instilled the much needed confidence the HNWI web visitor requires to leave their contact info and follow-up with a the broker. There are many tools we have tried and tested and a lot of them implied the operator (chat operator that is) to sit at his desktop/laptop with the backend of the website open waiting for chats to happen. This practice is of course not sustainable for the size of the teams of many companies in the yachting industry so we kept on searching for a better tool. In the end the one which we decided it is the best value for money and the most user-friendly for nontechnical users is from a company called LiveChat Inc. They offer several features for advanced customisation of every greeting in every page and also based on the language of the user (yes the tools ‘knows it’ before hand based on where the web visitor is typing from). Lastly, the tool has a wonderfully designed mobile app which means that you can manage your chats just like you would manage text or WhatsApp conversations from your phone. It doesn’t hurt that they offer a free trial period so you can test it and decide whether it is for you or not. 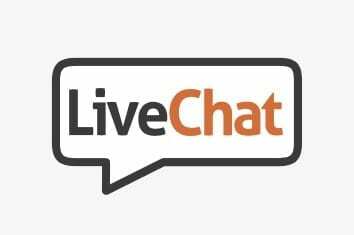 If you want to try to implement the Livechat on your business website go ahead and use this link and let us know what are your first impressions in the comments if you like. On the 29th-30th of June 2015, I was called to do the opening speech at the Superyacht interior international conference (links below), an invitation I gladly accepted. 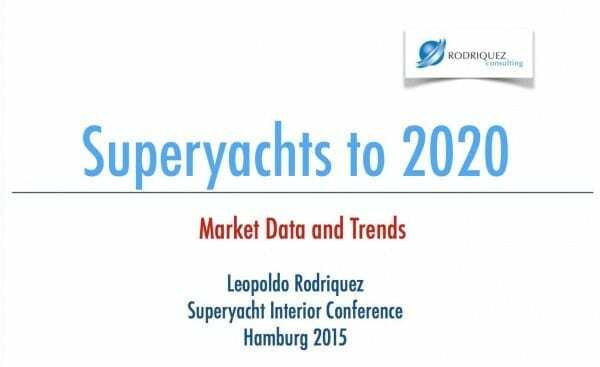 The focus of the conference was on design trends, construction materials, efficient project management, cooperation and communication among the stakeholders that are regularly involved in the creation of a new superyachts and refitting of exiting vessels. As I was given the responsibility to do the first lecture and the opening speech of the conference I decided with the team to stick to what we do best and open the conference with hard data on the yachting industry. We prepared the market data and forecasts on the superyacht segment (>24mt) together with qualitative trend analysis we created with the help of our panel of experts, our business partners and some of our clients. -goal #2 Start and fuel the conversation regarding trends, ideas, process innovation, and elements that are challenging the yacht industry while building the super yachts and the market towards 2020. I was pleased with the feedback received from our presentation (download link here) of the participants among which industry leading brands(shipyards) such as Lurssen Yachts the builder of the worlds biggest superyacht Azzam, Oceanco the shipyard that built award winning Alfa Nero, Fincantieri, Italy’s biggest passenger (cruiseliners) that is set to become a power player in superyacht and gigayacht (100mt+) building. Among the top players of yacht interior outfitting highly experienced participants such as Anjia Matzing from Metrica Interior and Mr Antonio Costamante of AIM Yacht Interiors were contributing to make the round tables particularly interesting together with the Managing Director of Genesis Technologies AG, Thorsten Steinbrecher a specialist firm in advanced audio/video entertainment systems and even commercial aviation representatives such as Antje Terno from Airbus. Where and how are they investing their investable wealth and what is the target market (U-HNWIs) allocation within the realm of the Investment of Passion ? How are the demographic and psychographic profiles of the HNWIs changing towards 2020? How to improve the yacht building process (with a special focus on the interiors and fittings) and what are the current issues to be addressed in terms of processes, tools, communication methods, and coordination of the stakeholders (system specialists, designers, shipyards, certification bodies. The design challenges, new materials, techologies, and the who and where of the innovation value chain. Marketing, using modern technology to enhance the experiential value and improve speed and efficiency in generating new leads, improving lead-to-customer speed and responsiveness of the sales team. Diagnostic of custom quotes, risk assessment for interior specialists, liability budgeting. These and a few other questions have been answered during our presentation which you can find available for download at this link (DOWNLOAD). The Antifouling paint market 2011-2015; numbers, trends and opportunities in the yacht industry. It took our team almost 3 years of research to determine the trends and peculiarities of the antifouling market for yachts and pleasure crafts. It was not an easy task to separate the products on the market that would theoretically serve only commercial vessels (commercial/passenger ships and workboats) and those, instead, dedicated to yachts, super yachts and pleasure boats. 2) The DIY (do-it-yourself) non-professional use done by boat owners. We have analysed that the breakdown of the above macro category can differ depending on the geographic area that is taken into consideration. For example there are more DIY customers in relation to the country’s overall fleet in France using antifouling products on vessels larger than 30 feet than there are in Italy. Whereas the number of shipyards that use antifouling and coating products for new vessels (before vessel 1st launch) larger than 25 meters is by margin greater in Italy than in France. It’s very interesting to observe that markets that are very fragmented in the distribution towards the DYI customers such as Italy show less profitability for the manufacturers than other markets where the distribution is much more efficient. In our professional opinion the associated the fragmented distribution channels are high and obsolete making a very poor use of technology. On the specific topic of point of sale, we have surveyed directly over 3000 qualified responders (boat owners, yacht brokers, marine paint specialists, captains, hardware stores and others) in 12 different countries (France, Italy, UK, USA, Spain, Slovenia, Malta, Croatia, Netherlands, Turkey, and others), asking them “where they would mostly would like to find (a sample) antifouling products?” Right after the physical stores and ship chandlers which still accounted for 50% of the answers 20% stated that he/she would prefer to find the products Online on the producer’s website. In our view this is a sensitive sign of how the generational shift will influence the distribution dynamic and its overall impact on profitability on antifouling coatings and associated products. Ultimately, the result of our survey show how the companies have a significant opportunity to increase profitability progressively shifting their distribution models and increasing progressively the use of e-commerce. 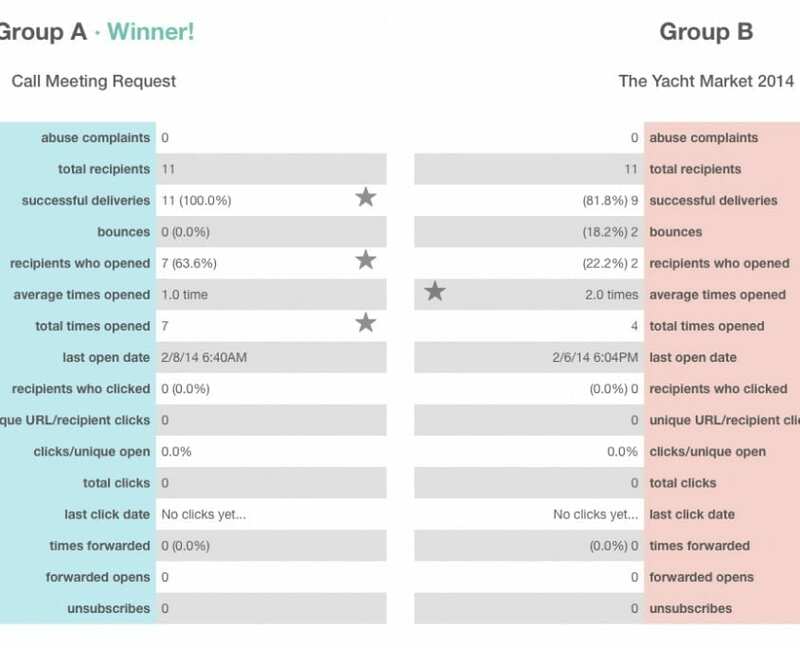 Through our research we also analysed the dynamics that relate the end users (boaters) and the professional users (shipyards) to be more or less loyal to a certain brand (please contact us here for more info). In general terms we noticed that the smaller the size segment and the younger the boat owner the less brand loyalty he/she would show. Whereas, in the professional use, both the brand choice and the brand loyalty had a high correlation with the customer support and after sales reputation of the brand (and manufacturer). The methodology: To accurately estimate this two markets we have built a complex algorithms to sub-segment they types of hulls and therefore estimate the amount of coating needed. Furthermore, we have used an adjustment factor for those vessels that do a new coat of antifouling paint every year and those that choose cycles of two years. Lastly, we have cross referenced the sales data in litres collected and estimated from direct research on the various players in the market (Akzo Nobel, Jotun, Hempel, Boero Group,etc..) with the data built through the new and existing fleet of vessels. Having collected and processed data form 2011 onwards with regards to the antifouling coating market for yachts and pleasure crafts, we were able to calculate and compare the compounded annual growth rates (CAGR). Between 2011-2014 and forecasting 2015 in specific geographic areas we have analysed key markets such as Italy, France and other European countries and the U.S. and others. 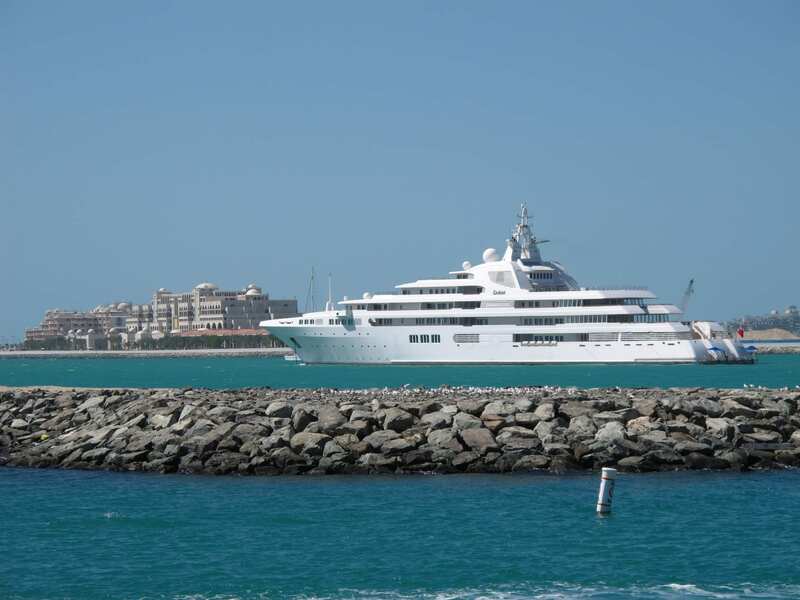 In terms of estimated monetary value, the data emerging from our research showed us that markets that have a strong production of large yachts and super yachts (>15m and >25m) such as Italy (Antifouling coatings -6% CAGR 2011-15) were more affected by the reduction of new built than France (Antifouling coatings +1.3% CAGR 2011-15). Instead, the “Replace” market for antifouling coating did not show such large difference between these two established yachting economies; Italy (Antifouling coatings +4.1% CAGR 2011-15) vs France (Antifouling coatings +6.5% CAGR 2011-15). https://rodriquezconsulting.com/wp-content/uploads/2014/09/IMG_0201-e1431376579782.jpg 448 600 Rodriquez Consulting http://rodriquezconsulting.com/wp-content/uploads/2014/09/Rodriquez-Consulting-logo11-300x94.gif Rodriquez Consulting2015-05-01 15:56:092015-05-11 20:36:32The Antifouling paint market 2011-2015; numbers, trends and opportunities in the yacht industry. I cannot deny to be a big fan of digital marketing and a fond believer that communication and marketing is largely underestimated in the marine and yachting industry. It is often the case in fact that you go at a boat show see a magnificent product, let’s say, a hand made mahogany wood sail boat, you know one of those vessels that really gives you an idea of hard work, passion for the job, incredible technical skills and countless hours with the utmost attention to details, but then you go have a look at their brochure, or and their website and you think…if only this product was presented better. I do understand that oftentimes the team of people behind a great vessel has its core skills concentrate on the technical aspects of yacht building and virtually none in the communication and marketing area, which tends to penalise their business resulting in lower on non-existing sales. Emails are as old as the internet in fact arguably older than the web itself but they are still extremely effective and also constitute long-term value in a company as all prospects that don’t buy today might be buying in the future, and that’s particularly true for boats as they are very often regarded as a very time-intense hobby or an entry in the retirement. Emails nowadays are not only a form of communication but can be an incentive to generate interaction with other digital assets and non digital occurences such as videos, websites, events, surveys and much more. They are a way to get to know your audience with time and understand their preferences their habits gathering a plethora of valuable information that will help your business and company refine its marketing and sales strategy. MAILCHIMP. It must not be a case as over. 1.5 million businesses are using it every day, and their servers channel through over 1 BILLION emails every day. 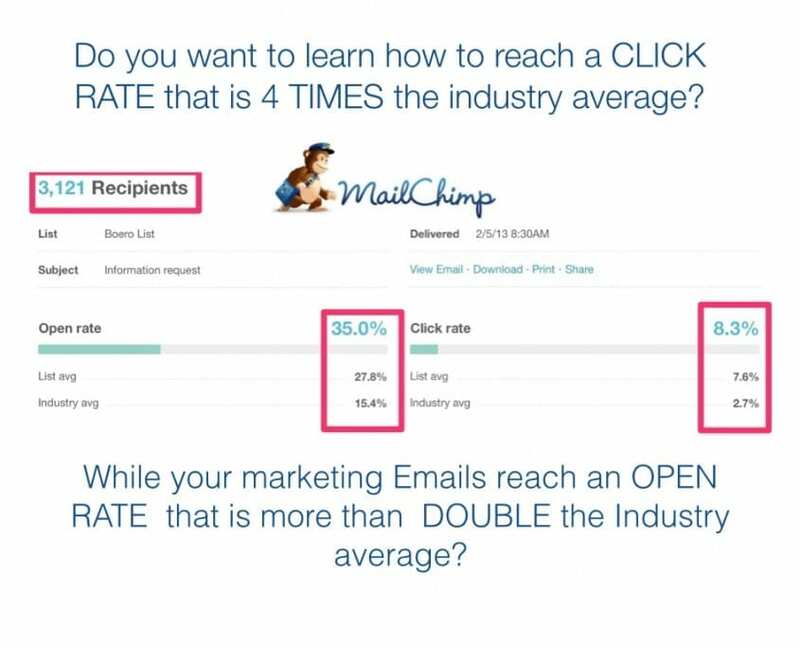 As you might expect this gives Mailchimp and as a consequence all its users a substantial source of data on how to best build your email. Indeed, MAILCHIMP allows you to test your audience inbox for spam filters, test visualisation on multiple devices, choose the best subject line to for your emails to get more opens or clicks and if you have a very international audience it even allows you to send the emails at a scheduled time that takes into account the time zone of the recipient. You don’t need to believe me you can try it it’s free just click here or on the logo above. 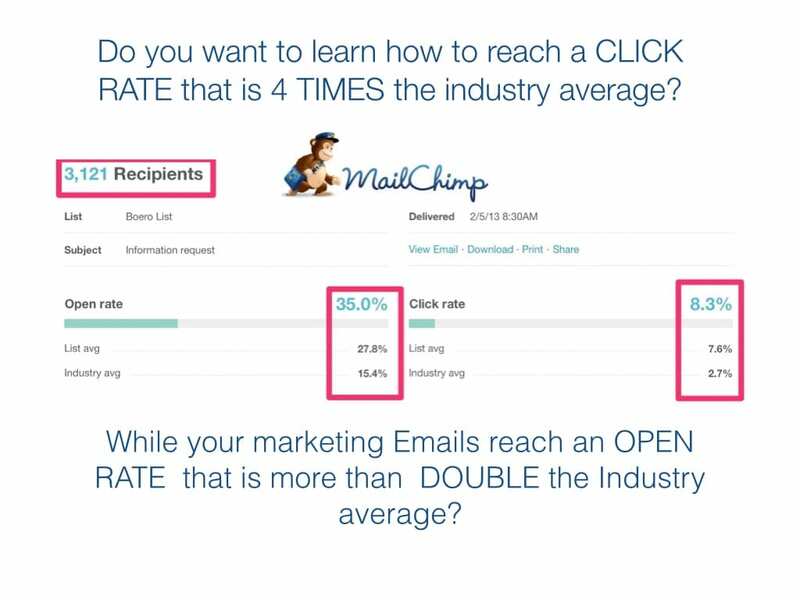 If you would like to do a 1 day training session for you or for your team on how to make the most out of email marketing you are more than welcome to contact us.